Bree Barnett Dreyfuss has taught Physics at Amador Valley High School since 2005. She earned her B.S. in Physics from Cal State University, Hayward with a minor in Art Studio and a Master in Teacher Leadership from St. Mary's College. Barnett Dreyfuss is a Mentor and Coach to new teachers in the Exploratorium's Teacher Institute. She is the as Vice President of Marketing for NCNAAPT. She strongly believes that the Physics education community is stronger through reflection and collaboration. While joining a professional organization may be one of the last things on a new teacher's mind, I think it is important to consider early in your career. Many organizations offer new teacher discounts for local and national meetings or even grants for certain projects and courses. Some organizations offer support programs for teachers in their first few years and others just attending is often beneficial as you learn about new curriculum, research, strategies, etc. There is nothing like the camaraderie you feel being in a large room filled with people that teach the same subjects you do. You may or may not be reimbursed for your membership dues or meeting costs but it is worth asking your district about it. Some organizations are for any and all science teachers, usually 6-12, others are subject specific and usually include secondary school and university level. Below is a list I hope to add to with links and brief descriptions of each organization. Some on my list are region specific but if you're outside the greater San Francisco Bay Area you may find something similar in your area. 1. National Science Teacher Association (NSTA): Promoting excellence and innovation in science teaching and learning for all. NSTA publishes a wide variety of science education books and journals all K-12, offers one national conference and three regional conferences each year, NGSS implementation resources, discussion boards and more. CSTA offers one annual conference that visits major cities in California. They offer resources for California specific NGSS standards, implementation timelines, assessment information, etc. CSTA publishes a bimonthly electronic newsletter as well. 3. American Physical Society (APS): A nonprofit membership organization working to advance and diffuse the knowledge of physics through its outstanding research journals, scientific meetings, and education, outreach, advocacy, and international activities. APS offers subject specific meetings throughout the year, publishes several journals, career guidance, resources and statements for several outreach programs including education, women in physics, minorities in physics and LGBTQ+ persons in physics. 4. American Association of Physics Teachers (AAPT): A professional membership association of scientists dedicated to enhancing the understanding and appreciation of physics through teaching. AAPT offers two national conferences/ meetings a year, a larger one in summer and a smaller one in the winter. There are several publications that come out monthly or weekly, in print and electronically. Teaching resources including videos, select pedagogical articles, free downloadable posters, recommended websites, blogs and simulations. AAPT also administers the national US Physics Team assessments for the annual team selection. The association is open to all physics teachers, including middle school, high school and university level. This is a program you have to apply to and is open to all science and math teachers in their first few years of teaching. Participants are compensated for their time, usually spoiled with food and are part of a supportive network of alumni from throughout the country. New teachers are matched with a mentor(s) for out-of-class support and an in-class coach. I like to describe mentors as the emotional support system, think of having a coffee date with that friend that always says just what you need to hear to motivate you to continue on. The in-class coaches are a unique chance to have a veteran teacher observe you solely for your benefit. There will be many times a new teacher will be observed, perhaps for evaluation by an administrator or by a district support coach for state credential clearance. But in both of those cases the observation fulfills someone else's need, not the new teacher's. An Exploratorium Coach observes new teachers to (shocking!) help the new teacher. The observations and communications are not shared with any school officials (even if they ask) and they will guide you to reflect on your own practice. Program participants also attend content and pedagogy workshops throughout the year and a multi-week institute in the summer. There are other Exploratorium institutes, programs and conferences offered throughout the year, I recommended going to as many as you can. All of which seem to offer subject-specific classroom resources, publications and conferences like AAPT. Additionally I found this list from CSU Long Beach that included some above and some for some non-physics subjects. Realistically you can't join all of these or attend all of these opportunities. But I strongly suggest being aware of what is out there and trying a few. Got a sister in San Diego? Visit CSTA when it's down there and its a two-for-one deal. Does your district pay for local conferences? Try a local AAPT section meeting. Or perhaps you get a grant for some continuing education? Join NSTA and get some journals or books. You're going to be pulled in a lot of different directions in your first few years so balance is key. Don't ever feel like you have to join a professional organization but as a current or past member of most of these, they do help. Going to a professional organization can be invigorating and inject some amazing new resources into your current curriculum. Building a network of people you can turn to for help is invaluable and much easier to do in person. At the 2018 AAPT Winter meeting in San Diego I presented with several others about the impact Paul Dohert of the Exploratorium had on me. I will add more links and materials but wanted to at least get the workshop materials up. Blinky Light pdf and powerpoint so you can see notes with links, see videos, etc. My Blinky Light page with additional resources is here. My Flickr page with several albums of pictures is here. We shared a video and portion of other videos of Paul below are the Exploratorium videos posted on YouTube. Paul in his own words, shown in its entirety of part of an interview with Paul. We showed part of a video about the Teacher Institute, featuring Paul and other staff members. An additional video of Paul explaining the whirlies (his favorite musical instrument) on the floor of the museum when ti was still at the Palace of Fine Arts. Presenting a 15-minute round table at the California STEAM Symposium 2017 on #BlinkyLights. As a round table it was awkward to display a powerpoint so this is the presentation and the workshop handout. Homework was assigned most nights to be stamped the following day. Each day the homework was reviewed and students self-corrected it. Students that did not complete it before it was stamped are encouraged to complete it while it was reviewed. Homework assignments could include textbook problems, reading textbook sections, completing worksheets or finishing a lab. Ideally the homework did not take more than 20 minutes a night. The homework was collected at the end of each unit and checked for completion and stamps. Assignments missing stamps or incomplete earned fewer points. Homework was 10% of the total grade. Suggested homework is supplied every night but is not required. Suggested homework may include textbook problems, reading textbook sections, or completing worksheets. The answers can be reviewed in class or via email upon request. Required homework is occasionally assigned and stamped. Required homework is most often completing in-class activities and rarely textbook problems or reading. Some problems are done collaboratively in class on whiteboards; students work in groups taking turns to solve them. Each week students take a short formative assessment so that the students and I know how they are doing. If students do poorly on the quiz they should consider completing more of the suggested homework. These weekly quizzes are 10% of the total grade and graded for accuracy. We did not track who took the survey so 99 (as of this posting) of over 200 students completed the survey. The full survey questions are available here. The results are shared below, with some reflection. 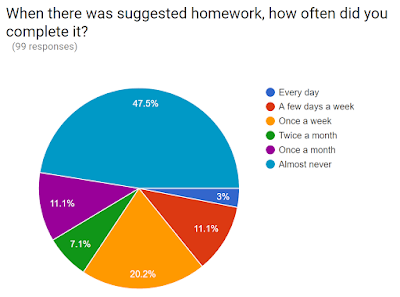 The majority of students prefer not having homework while about a quarter would have preferred to have homework. I was surprised at the 20% that said they wouldn't care either way. Students were then offered to explain their choice for nightly homework or not. The full text of students responses is here. This came as no surprise to me. 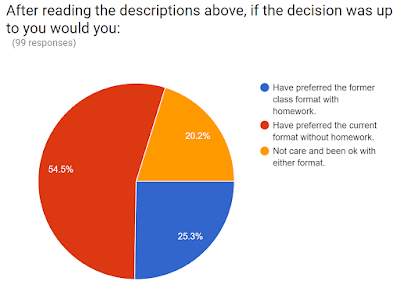 Depending on the assignment, I might ask the class, "Who would like to see the solutions to the suggested homework?" and I would get few hands. Sometimes no hands, which could mean students were self conscious and didn't want to admit that they were studious. Sometimes I still reviewed the assignment because I wanted the whole class to discuss the questions; other times I scrolled briefly through the rubric on a projector. When given the chance to respond (full text of students responses here) many mentioned they would have liked access to an answer key online to check their own work. Going forward I think that is a good idea. Required homework was usually finishing a lab in class. These self-reported responses were pretty close to my observations in class. This highlights perhaps the most frustrating parts of this new system. The suggested homework is there, every day, for students who need it. Yet the students that need it the most do not take advantage of it. The majority of students here felt doing more suggested homework would help them. 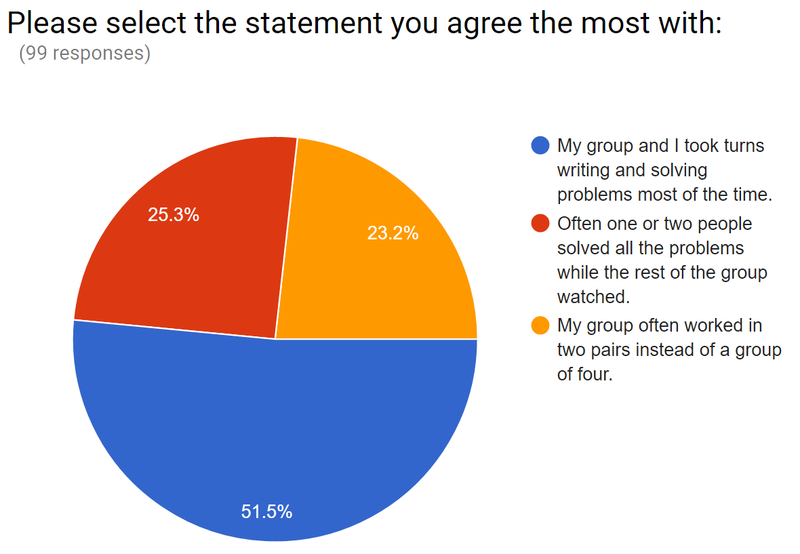 Almost 90% of the students said that that it would have helped them or at least maybe it might have helped them. 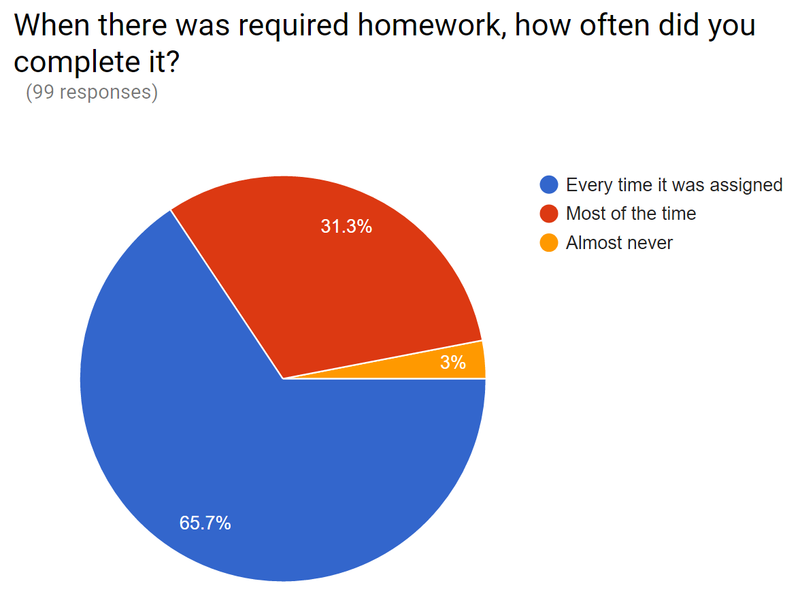 When given the chance to respond many students admitted they didn't do the suggested homework that should have and would have like some kind of incentive to do it. As a way of still assessing students' understanding and holding them accountable for learning the material we wrote weekly quizzes. They did not occur every week (in high school, rallies, programs, life, often gets in the way) but often enough to become routine. I was pleased to see that almost 90% of students thought that the weekly quizzes helped them figure out what to study or at least sometimes did. When asked about the length of the quizzes 88 of the 99 said that they thought the length was appropriate. When asking about their confidence going into the test I tried to take into account anxiety about the content and about the assessment. 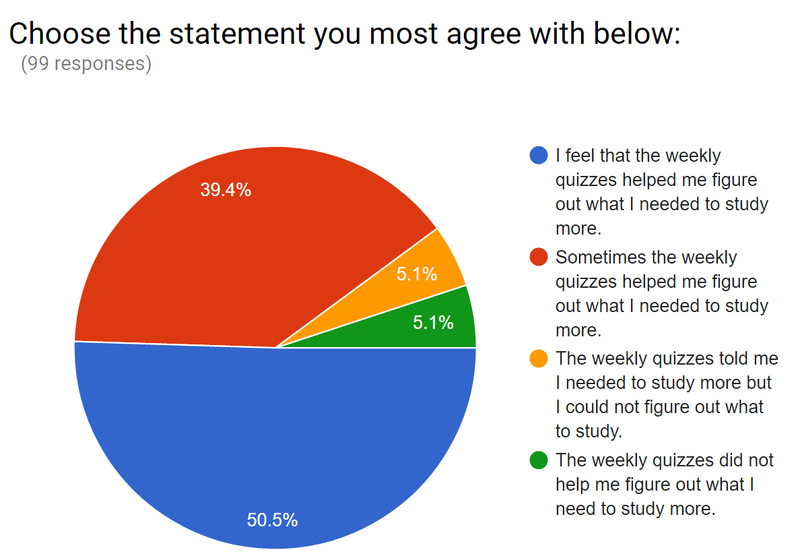 (40/99) I was not anxious about the weekly quizzes because I was confident in my understanding. (22/99) I was anxious about the weekly quizzes because I was not confident in my understanding. (29/99) I was anxious about the weekly quizzes because I was worried they would bring down my grade. (22/99) I was not anxious about the weekly quizzes because I knew they didn’t drastically impact my grade. (22/99) I was anxious about the weekly quizzes because I am always anxious taking tests or quizzes. (8/99) I was not anxious about the weekly quizzes because I am never anxious taking tests or quizzes. So a total of 73 reported feeling anxious about our weekly assessments for some reason . A few less, 62, reported not feeling anxious about the weekly assessments. Given the wide variety of aptitude levels in our classes this was not a surprise. 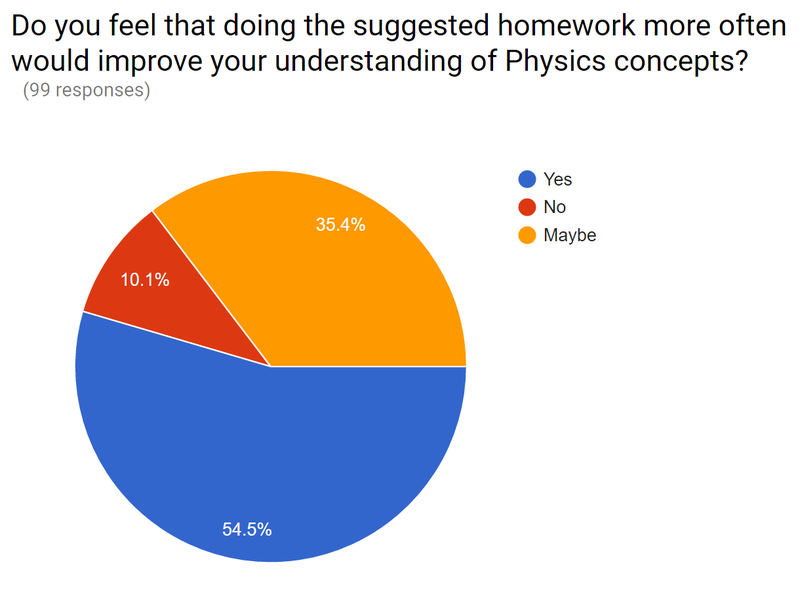 For some students, Physics is their toughest subject. For others it may be their only non-AP course. Our students' math levels vary from AP Calculus, AP Statistics and Multi-variable Calculus to our remedial math track. "I found the quizzes to closely resemble the textbook problems, this was a good way to motivate people to do the homework as it is direct practice for the quiz." We were pleasantly surprised by the positive effects of whiteboard practice problems in class. "Whiteboarding" can mean many different things in education. We used large whiteboards so that students could collaboratively solve problems together in class. Certain problems were assigned and the teacher would circle the room checking their progress. We found that we were often just checking their final answers as they had worked together past the normal stumbling blocks. 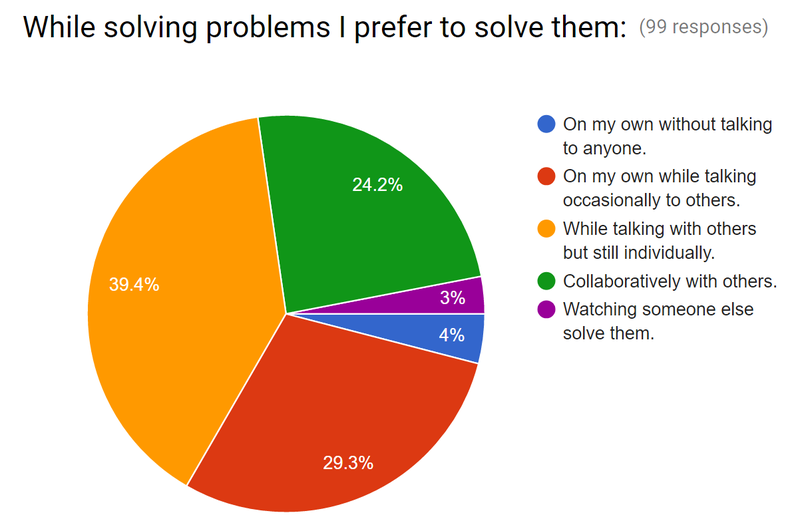 The conversations within groups about their own problem solving were wonderful, they worked through misconceptions and were able to refer back to previous work. This was a concern in some classes as there may be a student that understood the topic and wanted to be "done." We strove to change this by saying that students have to pass the pen every problem so that one person would not solve them all. Sometimes we would put two boards out per table and groups were given the option to work in groups of four or two. We were pleased to see that the whiteboarding helped students move towards a growth mindset. The majority of students felt that it was okay to make mistakes and correct them, often attributed to the temporary nature of whiteboards. 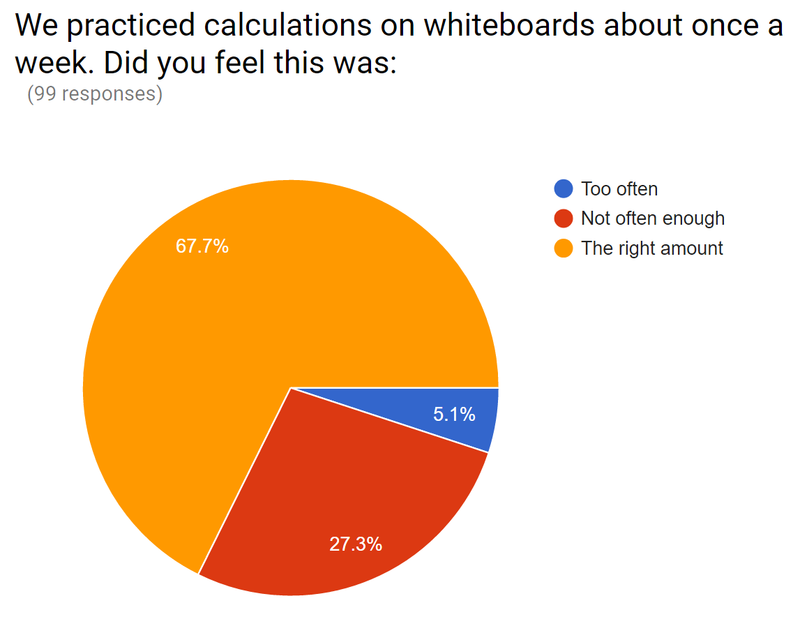 Again, we felt that this showed whiteboarding practice problems had been successful. We implemented the whiteboard problems in order to make-up for the calculation practice students would not be doing through homework. We often determined which problems to use by looking at old homework assignments and picking problems we really thought students needed to try in order to understand the concepts. This surprised me considering the previous responses to whiteboarding problems, a format I would attributed to the green colored "Collaboratively with others" response above. 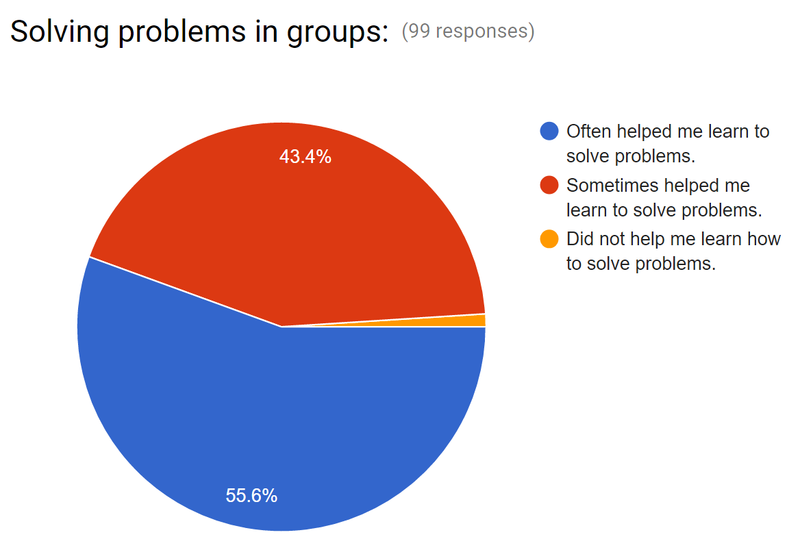 Most students preferred a individually working on problems but talking for at least part of the time with others. A few students specifically responded that they would like more individual practice in the Think-Pair-Share format. One student suggestion I really liked suggested using four small whiteboards, one for each student, and then having students combine them. It is possible that while I wrote "while talking to others" to mean "talking to others about the problems I'm solving" that students interpreted it as being able to socially talk with their friends while working on problems. The multiple choice portion of our tests has been very similar to years past although more of the free response has been changed. We feel that we have increased the difficulty level of the free response, adding more questions about their labs and analyzing data to replace simpler "plug & chug" problems. We cannot directly compare test averages year to year because there are many variables: I was gone on maternity leave twice in the last six years, did not teach Physics one year and Brix has been teaching Physics for only three years. We have also been changing much of our curriculum to better align with the Next Generation Science Standards. Our impression has been that the test averages are similar to past years if not higher. The overall class averages have been higher than in years past by small amounts. Many of the student comments were expected and not surprising given the nature of the age group we teach and the competitiveness of current high school academics in our area. While we feel this “No Homework Experiment” accomplished some of our goals it is not a “one size fits all” pedagogy and a certain amount of differentiation is still necessary. Both teachers have noticed that the lower level students that might have been at a B- or C+ before are up to a grade lower this year. This might be attributed to the 10% that used to be given for homework completion was based on completion (or corrected completion) and not accuracy their first time attempting it. We are inclined to think that these students would benefit more from practicing the concepts more by doing the suggested homework but since it is not required, they won't do it. We both intend to continue without required nightly homework for regular Physics. Given student responses a few more required assignments will be added and we are working on an incentive system for students that should be taking advantage of the suggested homework system. 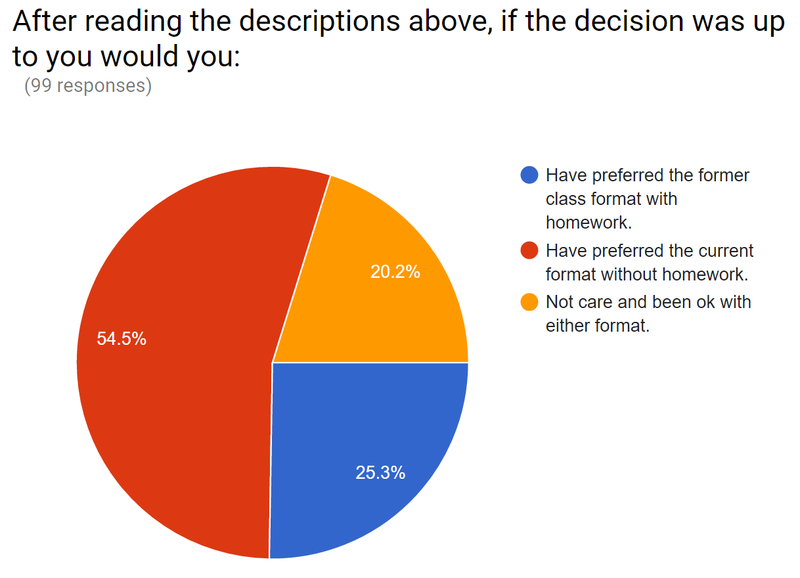 We don't feel comfortable "requiring" the suggested homework if they are below a certain grade level as that complicates grading. 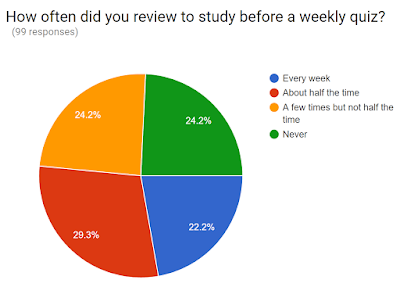 Several students suggested making one assignment a week required which is something to consider and it might be enough to help the lower level students. Any and all suggestions about further encouraging struggling students are appreciated. If any additional reflections are made before the end of the school year I will add to this post. If you have any specific questions feel free to send them my way. Do You Need the Square? Students often have trouble with proportions and relationships. What goes up when another quantity goes down? How much does it go up? Experience hands-on activities that show students the difference between an inverse relationship and an inverse square relationship. Explore examples using light, gravity, and electric charge. From the NGSS website: "NGSS Evidence Statements provide educators with additional detail on what students should know and be able to do. These are statements of observable and measureable components that, if met, will satisfy NGSS performance expectations." "The evidence statements, as described here, describe what teachers or assessors would observe (not infer) from successful student performance of each performance expectation (PE). The evidence statements can serve as supporting materials for the design of curriculum and assessments. In the NGSS, each PE is accompanied by a foundation box with associated practice, core idea, and crosscutting concept. The evidence statements expand this initial structure to include specific, observable components of student performance that would demonstrate integrated proficiency by using all of the necessary tenets of the practice to demonstrate understanding of the disciplinary core ideas (DCIs) through the lens of the crosscutting concepts (CCC)." "...the evidence statements are written to provide more clarity about what the PEs ask students to demonstrate, these statements are not sufficient to replace lesson plans or assessment items; asking students to simply perform the PEs verbatim would not be useful for instruction or assessment." Bree Barnett Dreyfuss has taught Physics at Amador Valley High School since 2005. She earned her B.S. in Physics from Cal State University, Hayward (now East Bay) with a minor in Art Studio and a Master in Teacher Leadership from St. Mary's College of Moraga. Barnett Dreyfuss is active in the Exploratorium's Teacher Institute as a Mentor and Coach to new teachers. She currently serves as Vice President of Marketing for the Northern California/ Nevada Section of the American Association of Physics Teachers. Focusing on hands-on learning and visual representation she strongly believes that the Physics education community is stronger through reflection and collaboration.